An unusual but beautiful flower to use for bouquets is the amaryllis. It is a bulb flower and is available in the winter and early spring months, so it gives a very “wintery” look wherever it appears. 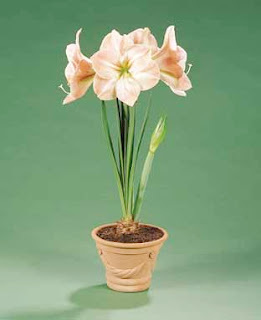 Most people know amaryllis from the potted plants that are often given as gifts at Christmas time. Cut amaryllis blooms come in a very crisp white and a striking red color. A single stem usually carries at least 2-3 large, showy blooms. These blooms are comparable in size to an Asiatic or stargazer lily. When used in a bridal bouquet, they are beautiful alone or mixed with other flowers. The image below is of a simple, white amaryllis bouquet we designed for a photo shoot. Amaryllis can also be mixed flawlessly with other non-seasonal flowers. The following photos are of bouquets we did for a wedding January 12, 2008 for Lisa (Reyes) Grabel. The bride had white amaryllis with peach roses and pearled stephanotis. We took these snapshots during different stages of the bouquet production. The first shot is without the stephanotis, and the second shot shows the finished product. 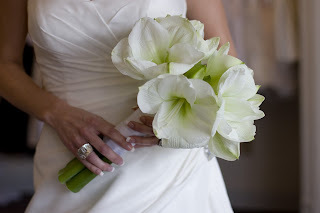 Amaryllis blooms are a great way to incorporate winter seasonal flowers into your wedding. They give a great bang for your buck!! !